I just LOVE this Greek Pita Pizza y'all! It's so easy to make. I think it might be the EASIEST pizza recipe you can make at home! It's certainly one of the tastiest! My version of a Greek Pita Pizza is seasoned pita bread topped with all of my favorite Greek flavors such as English cucumbers, red onions, green peppers, tomatoes, feta cheese, Kalamata olives, Greek marinated chicken, and some mozzarella for that melty cheese goodness that holds it all together atop seasoned and toasted pita bread. 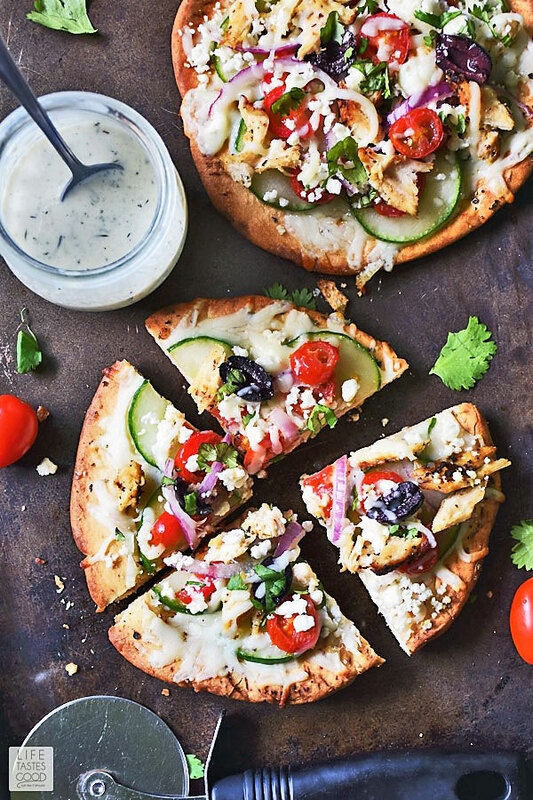 Serve this individual Greek Pizza with some homemade Tzatziki sauce any night of the week for a quick and super flavorful dinner. This Greek Pita Pizza recipe is basically a deconstructed gyros sandwich. Recently, I broke down the components of a gyros sandwich to make a Gyros Salad and it was a big hit! Don said he thought it would make a delicious pizza on pita bread. He has some good ideas sometimes, so I gave it a try and you know what? He was right! You could call this a Gyros Pizza recipe I guess, because it's basically everything I'd put in a chicken gyros sandwich only flattened out and eaten like pizza. So good! Does pita bread make a good pizza crust? I love using pita bread as a pizza crust. Using a store bought pita bread for pizza crust is easy and the pita bread has a nice texture. 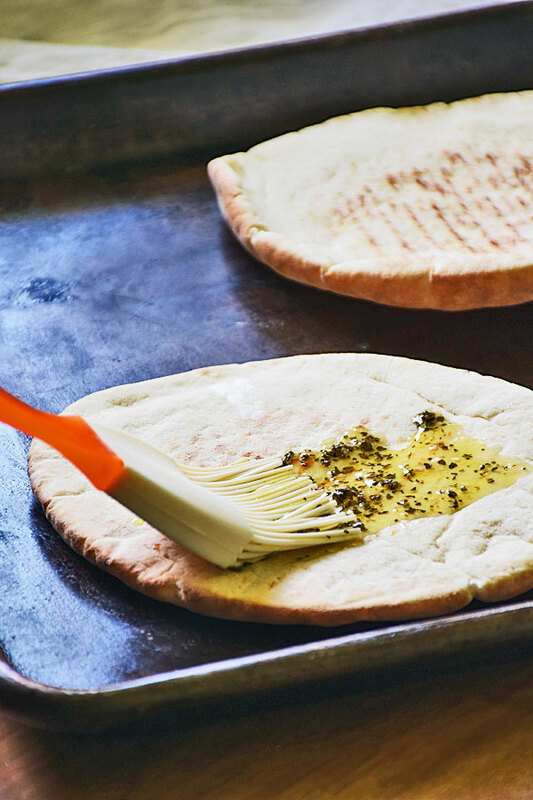 To use pita bread to make a Greek pita pizza I recommend brushing the pita bread with an olive oil and herb mixture. For this Greek Pizza recipe I combine olive oil, dried oregano, and salt and brush it on the pita pizza crust. Then I pop it in the oven for about 10 minutes to toast it before topping with all my favorite Greek Pizza toppings. The pita pizza crust is slightly crispy on the outside but there is a pocket of air on the inside which makes it pillowy soft at the same time. Pita pizza crust is the perfect base for my Greek Pizza recipe! Can you put Feta on Pizza? Sure you can! Feta cheese is a soft brined curd white cheese made in Greece from sheep's milk. It's a crumbly cheese with a slightly grainy texture and has a tangy flavor. Feta is commonly used in salads and pastries, but Feta cheese doesn't melt, and seeing as this is pizza, I added some mozzarella to give this Greek Pita Pizza some creamy, melted cheese. Because mozzarella melts so nicely into all the ingredients, it helps to hold all the toppings in place on this Pita Pizza. I top my Greek Pita Pizza with traditional ingredients you'd find in a Greek salad or a gyros sandwich. First I sprinkle on a little mozzarella to add that creamy cheese touch every pizza should have and then I top with sliced English cucumbers, red onion, some diced green bell peppers, tomatoes (i use halved grape tomatoes because they are easy to work with), Kalamata olives, Feta cheese, marinated Greek chicken, and a little more mozzarella tops off my pita pizza. I pretty much go all the way when topping my pita pizza, but if you have some picky eaters, you might want to do a pizza bar and let everyone top their own individual pita breads as they like them. Bake the pita pizzas in the oven for about 10 minutes until the cheese is melted nicely and everything is heated through. Don't forget the Tzatziki sauce and let everyone decide if they want to drizzle it on top of their pita pizza or dip the pizza in the sauce. It's great either way. Meal Planning TIP: Cut up extra of all the toppings and make extra marinated Greek chicken to enjoy in my Gyros Salad recipe for lunch or an easy dinner later in the week. 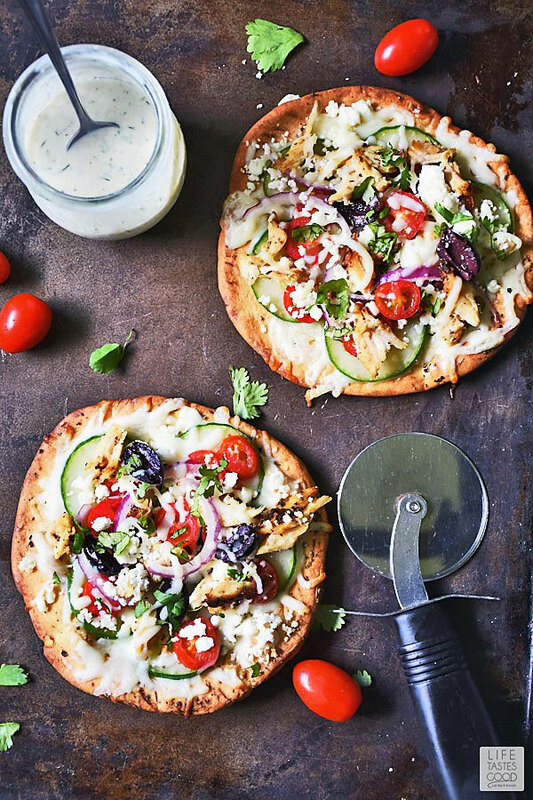 Tzatziki Sauce is a creamy yogurt based sauce that makes everything taste better, including this Greek Pita Pizza! Can you tell I love it? Tzatziki Sauce is made with yogurt, garlic, and cucumbers, as well as a little lemon, fresh dill, and olive oil. 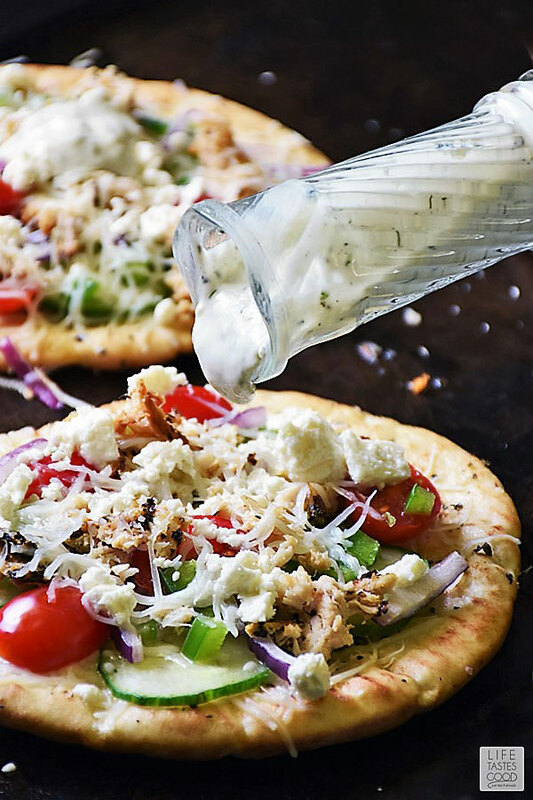 It is a refreshing, creamy white sauce to drizzle on this Greek pita pizza and pushes the flavor profile over the top! Tzatziki sauce is super easy to make and can be made up early in the day or a day ahead. It goes great on just about everything! We love Tzatziki on this Greek pita pizza as well as my Greek Bowl with Meatballs and my Greek Style Pork Chops recipe or just as a dip for vegetables for a healthy snack. Tzatziki sauce will keep for a few days in the fridge, but because of the fresh cucumbers it does go bad rather quickly. This isn't a problem in my house, because we'll dip just about anything in Tzatziki sauce. It doesn't last long around here that is for sure! 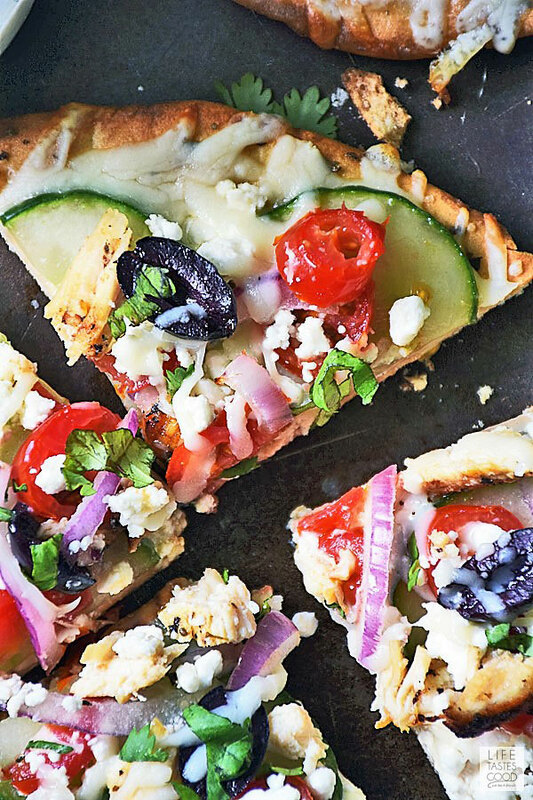 Did you make this Greek Pita Pizza? I'd love to hear your thoughts. Greek Pita Pizza is seasoned pita bread topped with all of your favorite Greek flavors. 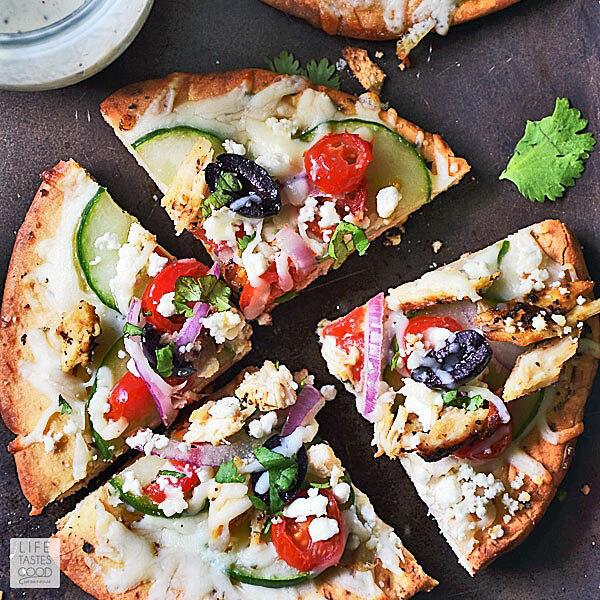 Serve this individual Greek Pizza with some homemade Tzatziki sauce any night of the week for a quick and super flavorful dinner. Shred the chicken into tiny pieces for topping the pizza. Place pita bread on parchment lined baking sheet in a single layer. In a small bowl, combine 3 tablespoons olive oil, 1/4 to 1/2 tsp salt and 1/2 tsp dried oregano. Brush the mixture on to one side of each pita bread. Bake in preheated oven for 10 minutes until lightly toasted. Remove from oven and set aside until ready to use. Top each toasted pita pizza with 2 tablespoons mozzarella cheese, about 5 cucumber slices, 1/8 cup tomatoes, 2 tbsp diced green peppers, 2 tbsp red onion, 2 Kalamata olives, 2 tbsp crumbled Feta cheese, and about 2 tbsp of shredded marinated Greek chicken. Put another 2 tablespoons of mozzarella cheese on top and bake the pizzas in the oven for about 10 minutes or until the cheese is melted nicely. Serve with Tzatziki Sauce and enjoy! 1. Use an English cucumber (aka hothouse cucumber). English cucumbers are longer and more slender than regular cucumbers. They are typically not waxed so you'll find them wrapped in plastic instead. The seeds of an English cucumber are smaller and easier to eat, so there's no need to remove the seeds.